Meghan, who is also dating Prince Harry has hung out with Priyanka in the past, too. From Usher to Jay Sean, Priyanka Chopra seems to be hobnobbing with the who’s who of Hollywood. 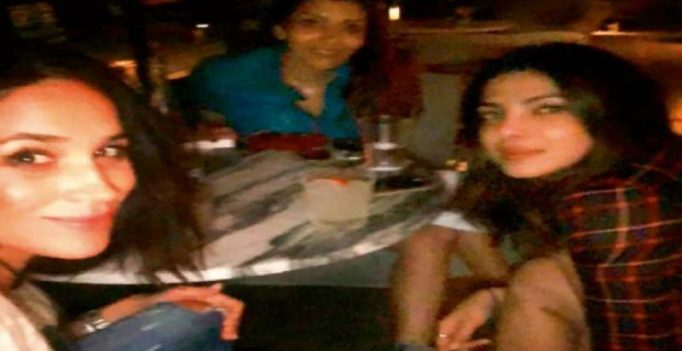 Priyanka, who’s currently basking in the glory of her hit American TV series Quantico went out for a dinner with her girlfriends on the weekend. Her girlfriends turned out to be Suits star Meghan Markle, and producer Mubina Rattonsey. Not one to miss out on updating fans about her life, PeeCee posted a picture of their dinner date on Instagram, with the caption “Girls just wanna have fun.. @meghanmarkle @mubinarattonsey #LAlife (sic)”. Meghan, who is also dating Prince Harry has hung out with Priyanka in the past, too. Last summer, she shared a picture of her and Priyanka chilling by the pool, captioning the picture, “Cheers to the weekend. With this @priyankachopra (sic)”.